Two recent shots from visiting volunteers. We do our best to keep up with the blogosphere. New links 2010 - 2013 - Learn what the experience is like! Hahn Huang - from Portland Oregon to Cambodia. Great blog. How to build a fish farm in Cambodia. Phil the vet is one of our heroes. Jimmy Mac's journey. A team of Texans hit the trail and teach at the school. Jan 2010. Pavan and Loic - amazing support from two fundraising champions. Pay it Forward fundraising page. Ong Wee and Nicole. In November 2009 students from Chung Cheng High in Singapore visited the school and orphanage and really got stuck in to a physical project - building the foundaitons for the study room now enjoyed by the orphans. This was certainly no picnic, but in the class blog there's little complaint - though do we detect a hint of relief at completing the project? A huge thanks to these students. An expanding list of Links! Makoto Kimura’s website posted in 2005. Makoto is one of the core Japanese supporters of the school, and he set up this website (in English and Japanese) to share the unfolding story. Yoshikazu Tsuji’s website posted in 2005. Yoshikazu and Makoto were both impressed by their Savong School experiences and independently set up websites, and later met. Yoshikazu’s site is in Japanese. This is a Japanese NGO or Non Government Organisation which provides some support for the school among other projects in Cambodia. Site is in Japanese. Deathcab for Lanny. 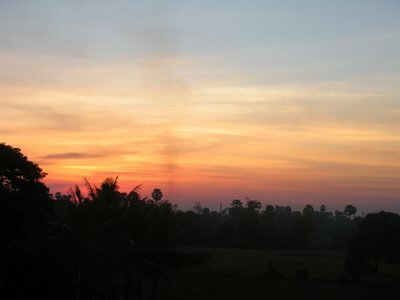 A travel blog posted in February 2007. L anny Chan is a kick boxing fan from Toronto, and his journey took him to Thailand, but then to Cambodia where he spent time at Savong’s School. This was the first blog we saw by a volunteer to the school, and it was good to see things through his eyes. He’s a funny writer and he had great things to say. Klass Visit to Savong’s School. A photo album. In December 2007 a group of young people came to the school, volunteered, taught Badminton and made a big donation of books and stationery. This is the album of their wonderful visit. A blog posted March 2008. Steve and Anne’s Travel Blog. Love this couple! They’ve travelled extensively (amazing shots from Africa) and they took the time visit to Savong’s School while in Siem Reap. Like a lot of travellers these day, Steve and Anne don’t just want to see the sights: they want to meet the local people and understand their situation. ICU Unesco Club. Posted March 2008. A Japanese club visited the school early in 2008 and put up these pages. In Japanese. AnnTrak’s Flicker page. Posted in 2008. Ann is a super-traveller and amazing photographer. I found some wonderful, warm photos of Savong School students here (love the shot of the contemplative young monk). A blog posted November 2008. A day at Savong’s School. Posted by a Lee Ming visitor from Brunei and her group of friends who volunteered and also contributed computers. Great photos. A blog posted November 2008. Scribbles from a midnight diary. Blog by an enterprising American, Phil who is a vet in Hollywood who is raising money for proper wells in remote rural areas via the Cambodian Good Water Fund. He met Savong and together the visited the school and further afield. Good guy and great cause. March 2009. Jamie and Anna - two really dedicated volunteers. These two intrepid travellers spent weeks at Savong's School - living with Savong and Aneed and working at the school. While there Savong was developing the small orphanage - and this is a project that really caught the hearts of Anna and Jamie. Their photos and their story are excellent. Late in 2008 an Australian visitor (currently living in Hanoi) came to Cambodia and while here to compete in the Angkor Wat Half Marathon also took the time to visit Savong's School. Her comments about Cambodia are worth a read. By the way, the photo below was snapped by our visitor from the roof of the school at sunset. "The inspirational thing about the Cambodian children is they do not complain or do not bemoan the hand that fate has dealt them. On the contrary, the kids are determined to make the most of what they have and provide a better life for themselves and their family." Steph is a 14 year old from Melbourne and she was really keen to get to Cambodia and volunteer teach. With her energetic family coming on the same journey (and loaded with lesson plans, and creative ideas,) this crew has taken the school by storm. Read Steph's blog and you'll see how wonderfully everybody connects. Right - The koala came too!